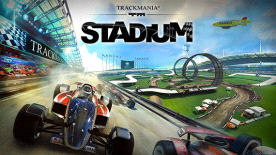 CLASSIC GAMEPLAY UNALTERED - Rediscover the racing feel from the original TrackMania Nations Forever. Accelerating, braking, navigating tight corners and surfaces stay unchanged. ENHANCED GRAPHICS - Benefiting from the latest technologies, from day to night, sunrise to sunset. Stadium feels more realistic and even more beautiful than ever. UNLEASH YOUR CREATIVITY - Grasp the latest ManiaPlanet technologies available in the Stadium: create a track, add custom 3D models, publish your pack, then share on ManiaPlanet. COMPETITION FOR EVERYONE - Competitions made by players like you, for players like you. A new official ranking for competitive gaming and ingame recognition for teams. Competitive gaming is now for everyone, everywhere. © 2001 - 2012 Ubisoft Entertainment. All Rights Reserved. Ubisoft, Ubi.com and the Ubisoft logo are trademarks of Ubisoft Entertainment in the U.S. and/or other countries. This game requires a free Maniaplanet account to play.